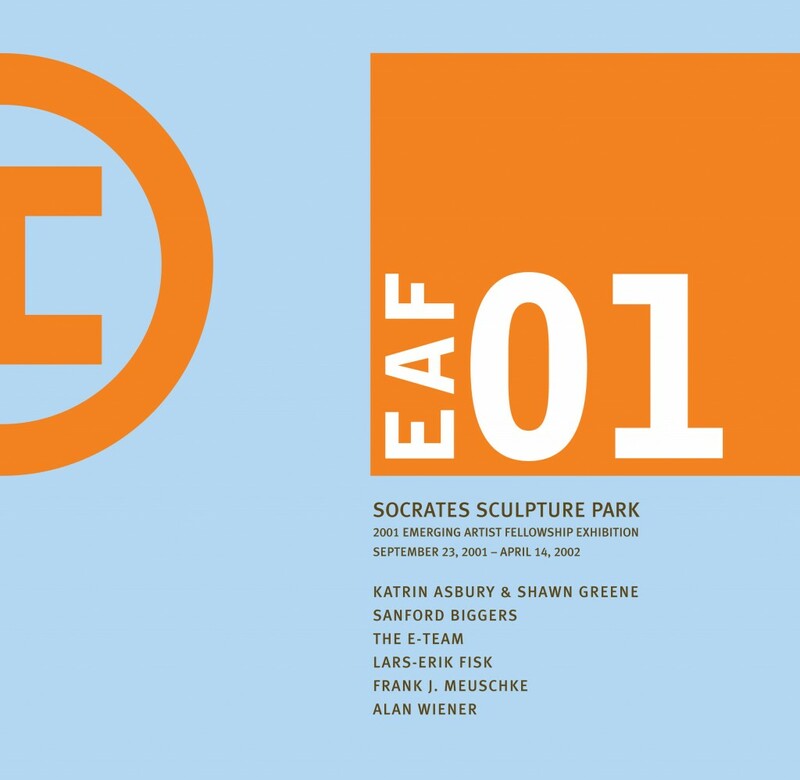 Socrates Sculpture Park is pleased to present an exhibition of works by the recipients of the EAF01: 2001 Emerging Artist Fellowship: Katrin Asbury and Shawn Greene; Sanford Biggers; The E-Team (Daniel Seiple, Franziska Lamprecht and Hajoe Moderegger); Lars Fisk; Frank J. Meuschke; and Alan Wiener. Now in its sixth year, the Emerging Artist Fellowship Program provides artists with financial support, a residency in the outdoor studio, and access to the space, facilities, materials and technical and administrative assistance to create new works for exhibition in the Park. The program is a laboratory where artists can experiment and take risks with their work, realize innovative and ambitious projects, and exhibit in a supportive, professional forum. 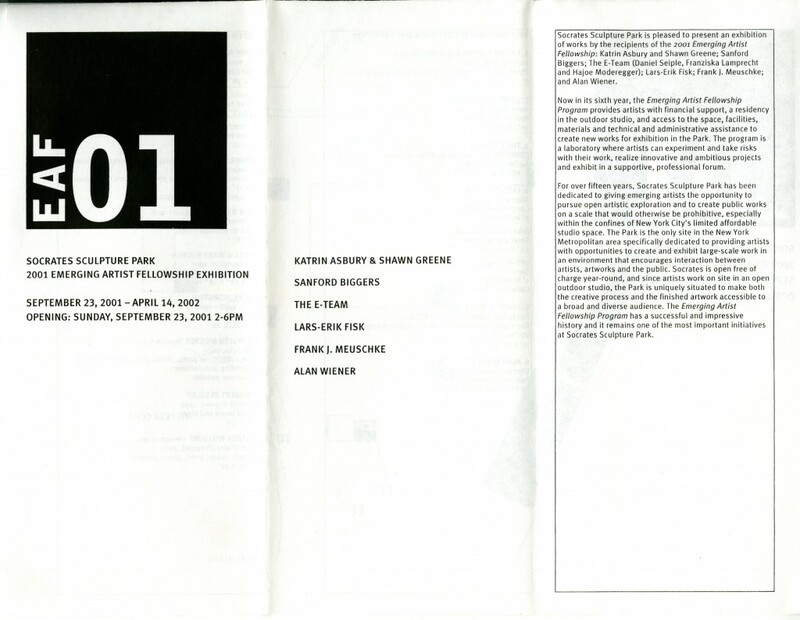 For over fifteen years, Socrates Sculpture Park has been dedicated to giving emerging artists the opportunity to pursue open artistic exploration and to create public works on a scale that would otherwise be prohibitive, especially within the confines of New York City’s limited affordable studio space. 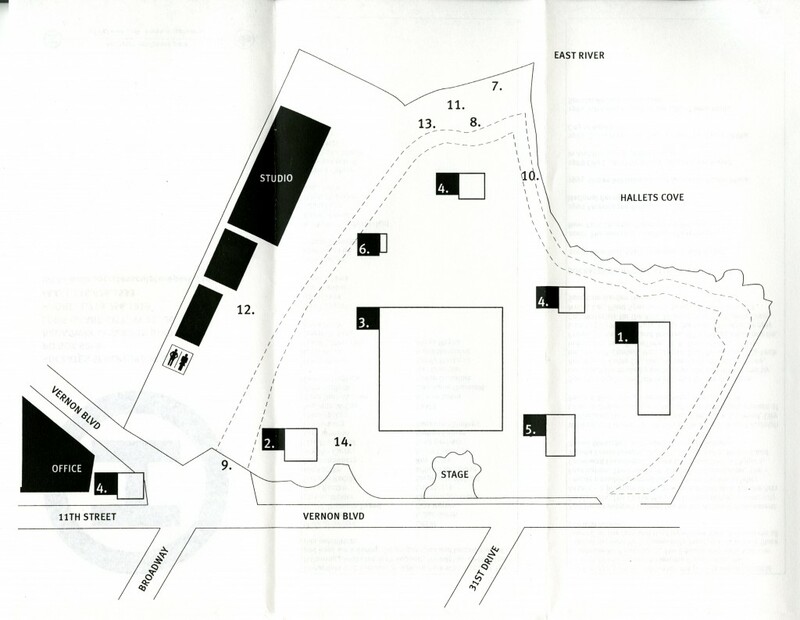 The Park is the only site in the New York Metropolitan area specifically dedicated to providing artists with opportuities to create and exhibit large-scale work in an environment that encourages interaction between artists, artworks and the public. Socrates is open free of charge year-round, and since artists work on site in an open outdoor studio, the Park is uniquely situated to make both the creative process and the finished artwork accessible to a broad and diverse audience. The Emerging Artist Fellowship Program has a successful and impressive history and it remains one of the most important initiatives at Socrates Sculpture Park. The Emerging Artist Fellowship Program is made possible through funding from the Jerome Foundation, the Heathcote Art Foundation, The Edward and Sally Van Lier Fund of the New York Community Trust, the New York State Council on the Arts and the City of New York Department of Cultural Affairs. Additional support is provided by the National Endowment fo the Arts, The Chase Manhattan Foundation, Community Assets — a program of the New York Foundation for the Arts — made possible through funding form the Rockefeller Foundation, The Horace W. Goldsmith Foundation, The Greenwall Foundation, Agnes Gund and Daniel Shapiro, Wendy Evans Joseph, The J. M. Kaplan Fund, Richard and Ronay Menschel, and individual contributions. Special thanks to the City of New York, Mayor Rudolph W. Giuliani, Queensborough President Claire Shulman, City Council Member Walter L. McCaffrey and the Department of Parks & Recreation, Commissioner Henry J. Stern. Socrates Sculpture Park is grateful for the generous contributions made by our friends and volunteers and by Ace Wire & Cable Co., Inc., Adirondack, Harold Anthony, Inc., John P. Corrieri, Inc., Electric Distributors Inc., Ex-Tech Industries, Inc., W.R. Grace Construction Products, Hanrahan and Meyers, IKEA, Image King Colorite, Long Island Gerneral Supply Co., Materials for the Arts, NYC & Co., Plant Specialists, Snyder’s Tree Farm and Sunshine Garden House.